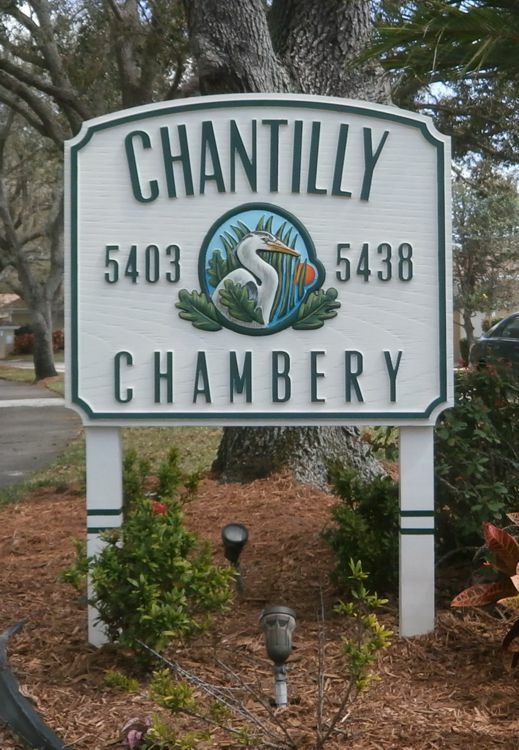 The Chambery subdivision of the Meadows in Sarasota dates back to the spring of 1983 where its four streets each featured sandblasted wood entry marker signs that performed well over the years. 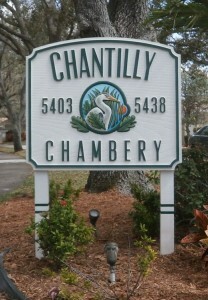 It was determined by the homeowners association that the time had come to update the look of the community and armed with an assistance grant design solutions were sought from local sign companies. Gulf Coast Signs presented the design that was ultimately selected and work commenced on producing four sets of 3′-0″ x 3′-6″ x 1½” custom 3d routed HDU panels. These panels feature a wood grain textured field with raised copy and border trim with an inset Heron graphic element. Each Heron graphic was hand painted making each entry marker unique to its neighborhood. The panels are mounted to their wood posts with concealed fasteners and are ready to identify each street for the next three decades.